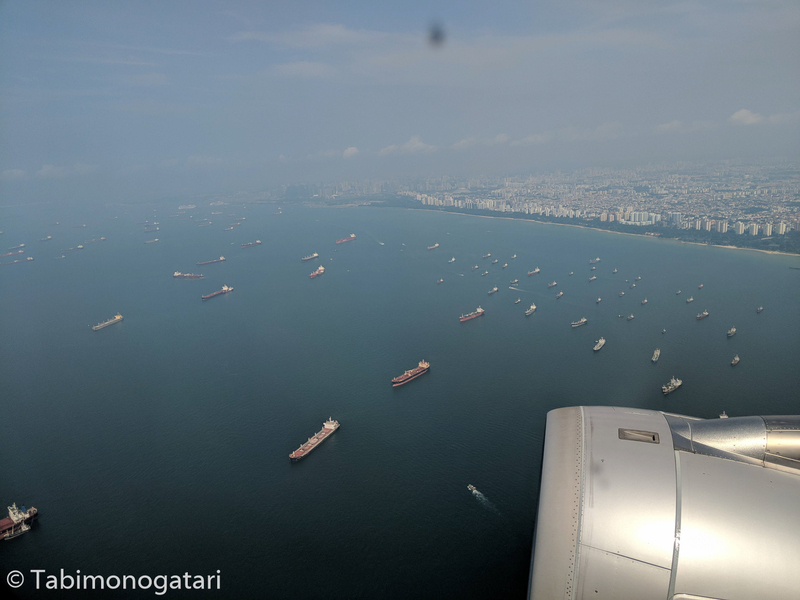 As we approached Hong Kong, I spotted an ocean of freight ships on the water. The airport is located on a different island on the West and is well connected by trains to the city center. 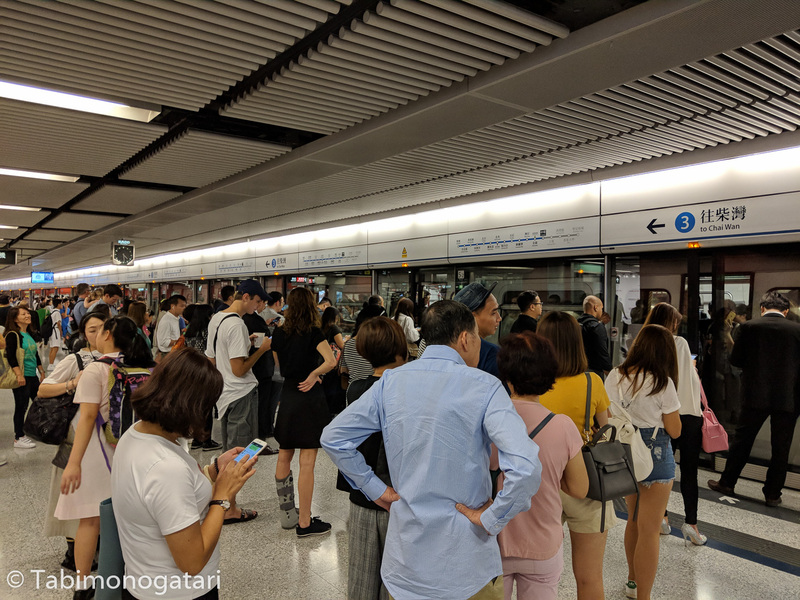 There are two options to get in, either take the fast and convenient Airport Express train, or be advantageous and use public transport like me. Needless to say it took me longer but it was fun to sit in busses and trains with the locals. 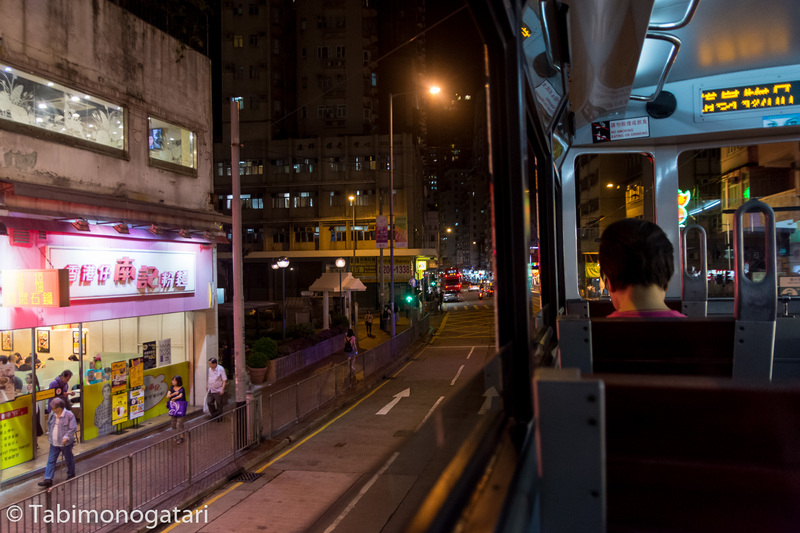 To do so, one should take the bus S1 to Tung Chung station where the MTR connects to both Kowloon and Hong Kong Island. An Octopus card comes handy and I highly recommend getting one even for a short stay. 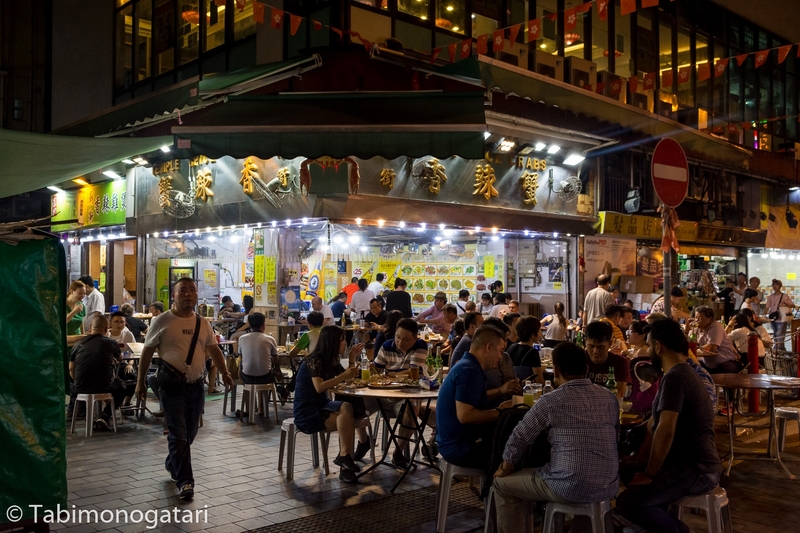 While Hong Kong is very international, I was surprised that Cantonese is the dominantly spoken language after all. Still, when I had to ask somebody something they always could answer in English. 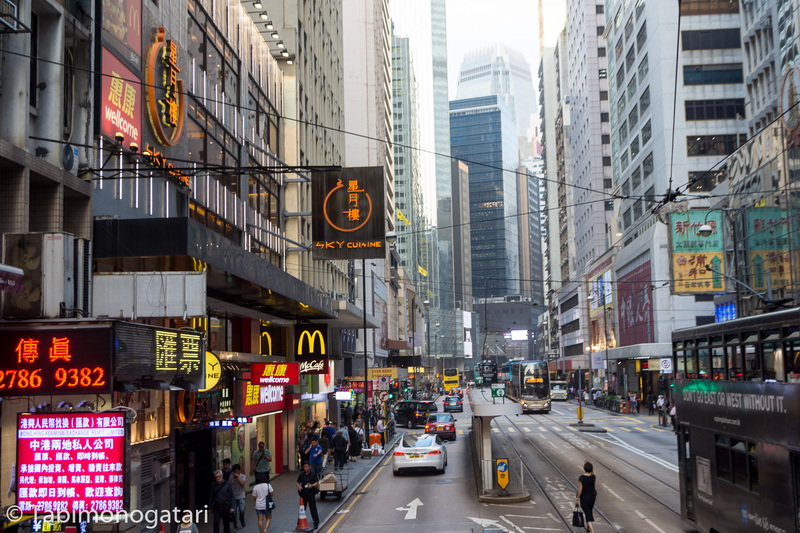 In about an hour I made it to Central station on Hong Kong Island and navigated through the crowds to find my also very central hotel. Here the forest of skyscrapers makes it hard to orient yourself. The first thing I like to do in a new city is getting an overview from somewhere up high. 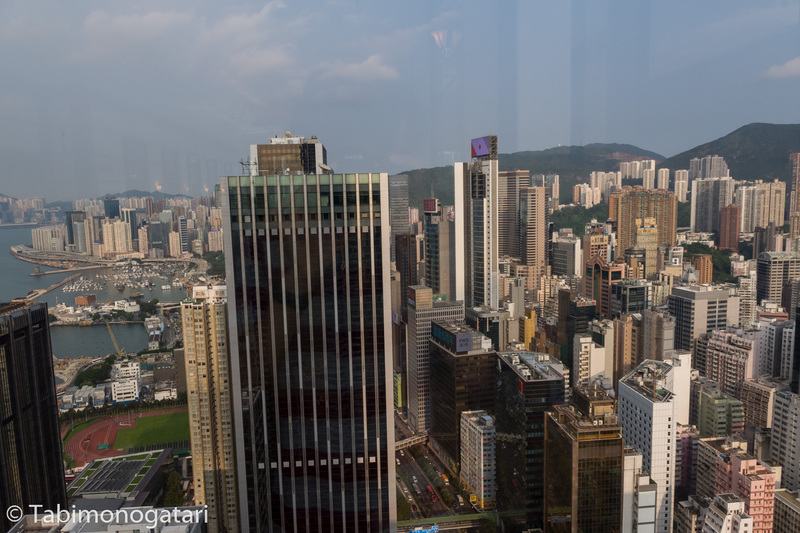 Good there is a free viewing platform on the 46th floor of the Central Plaza building, next to Wan Chai station. The self-playing grand piano gave just the right backdrop to appreciate in the view. In general, I got inspirations for activities from the extensive travel guide from Wikitravel. The English guide offers plenty of information on history and culture, sights to see and things to do. 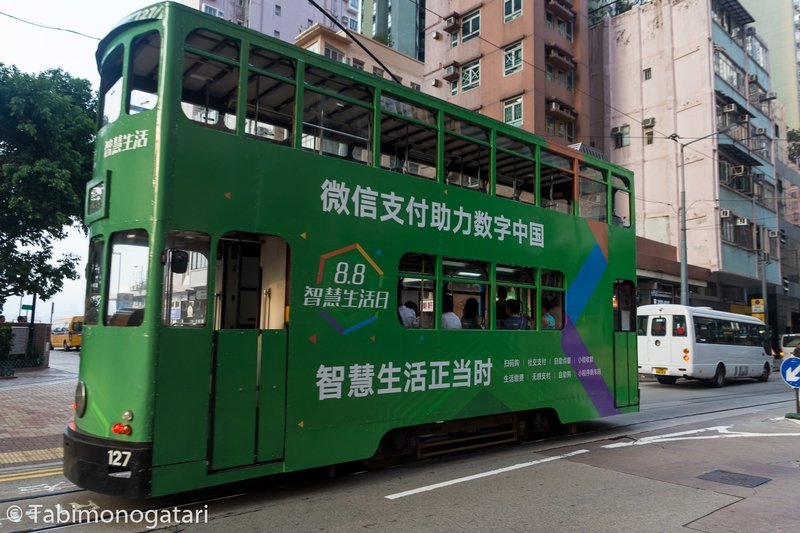 One of the suggested activities was a ride on the historic double-decker streetcar that runs across Hong Kong Island. 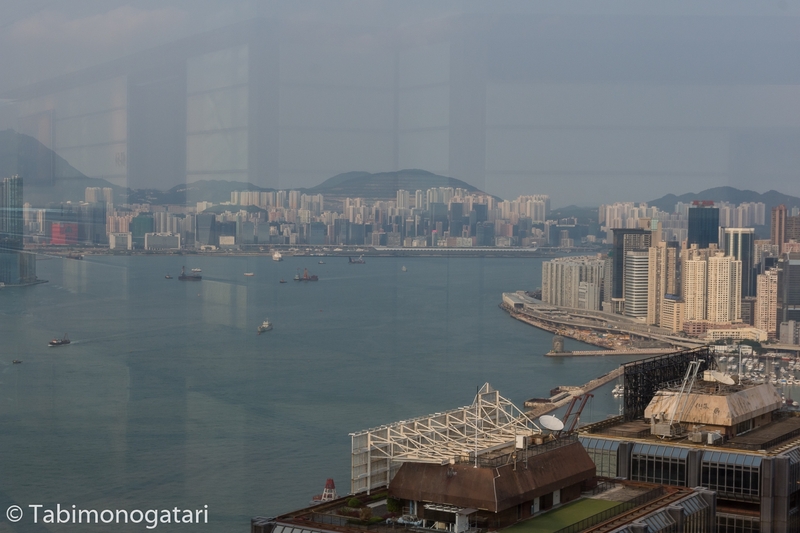 It is not air-conditioned as the other modes of transport but it allowed me to take photos through the open windows. 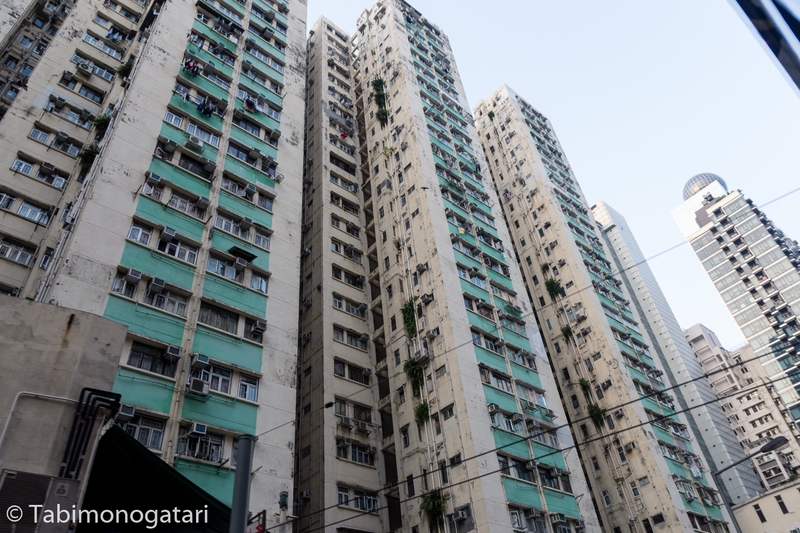 The ride began in Kennedy Town in the West and as we moved towards Central and Causeway Bay, the architecture changed as well. In the beginning there were predominantly old high-rises, but they were replaced with modern skyscrapers with LED screens soon. 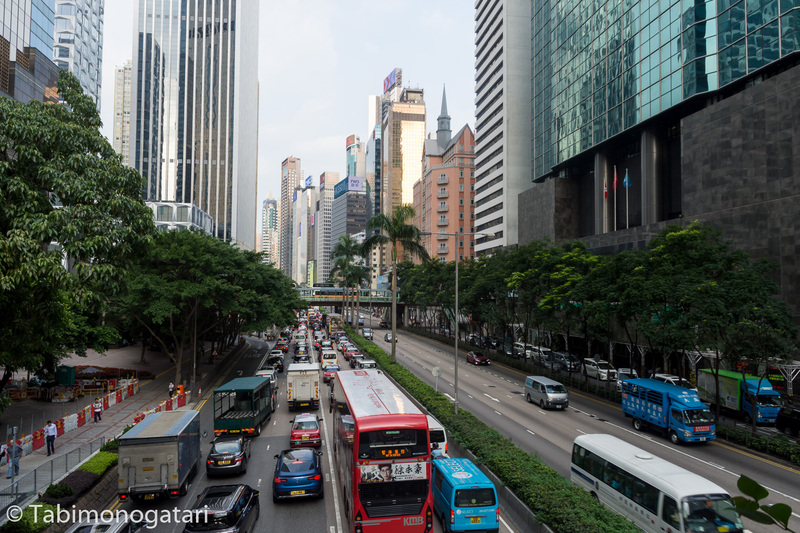 In the afternoon there was a lot of street traffic, so the bumpy ride took over an hour until I made it to the Eastern terminus in Shau Kei Wan. By that time it was dark outside and I was looking for dinner choices. Walking along the main street, I stumbled about the “Joyous Restaurant” that looked like it served authentic Chinese cuisine. Indeed, I was the only non-local person and joined a table with three other guests because it was so full. Little as I knew about the customs of dining in China, I tried to shadow the other guests to find my way around. First, I was served the dishes, chop sticks, a big bowl and a tea cup. Then one rinses everything with the tea pot and empties it into the bowl. This is a custom that originated from the time where patrons could not trust the cleanliness of the dishes. Hot tea was served free of charge and was refilled on request. 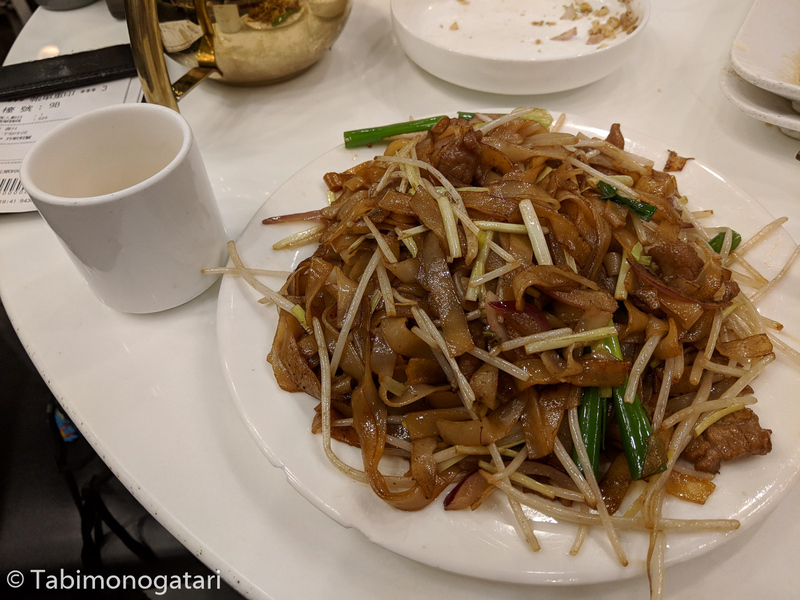 Luckily, they had an English menu with pictures, so I ordered deep-fried crab and a noddle dish with pork called chow fun. Both were incredible delicious and filling, and it only costed 100 $, so cheap! 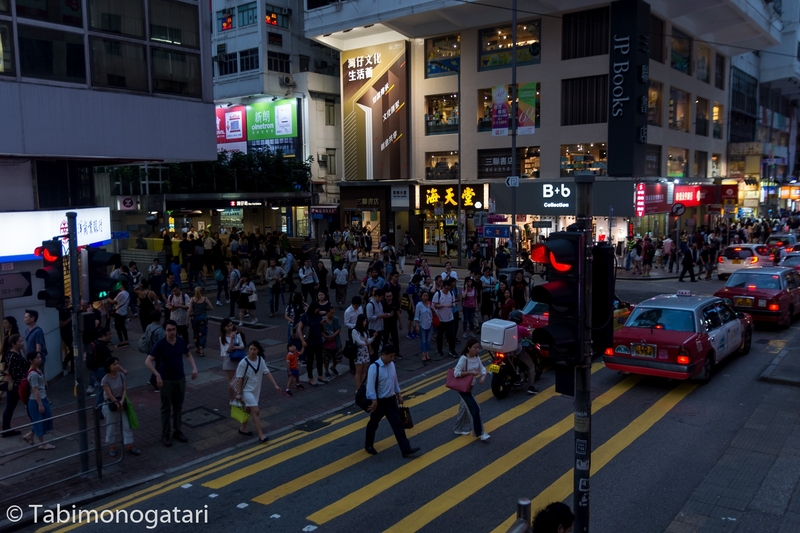 With the MTR I quickly returned to Central and hiked up a bit to reach the Peak Tram station. This cable car, the steepest one in the world apparently, took me up to Victoria Peak, 400 meters above sea-level. 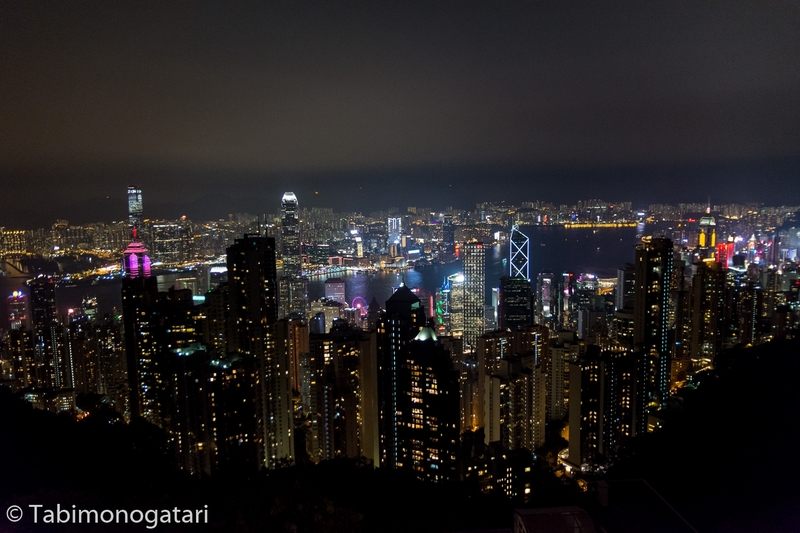 The night view over Hong Kong was a sight to behold. The queue to return was insane and I was glad to know about an alternative way, thanks to some prior research. Around the corner there was a bus stop and a so-called mini-bus frequently takes passengers down to Central station. The bus was indeed small and fitted about 16 people at a time and raced down the hill. 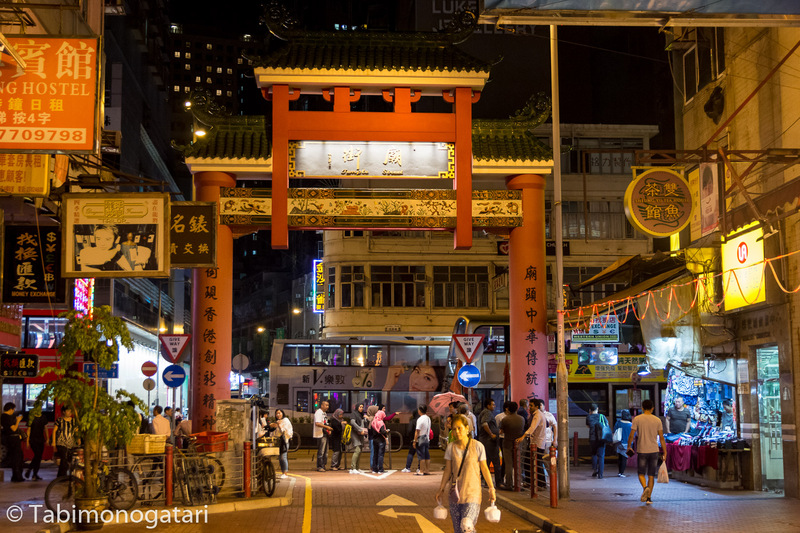 With the MTR I passed the bay to Kowloon and checked out the Temple Street market which was also open late at night. Good negotiation skills are needed for a bargain; I settled for some street food instead. After some fried chicken and a squid skewer I was happy to go to sleep, just in time for the last train.